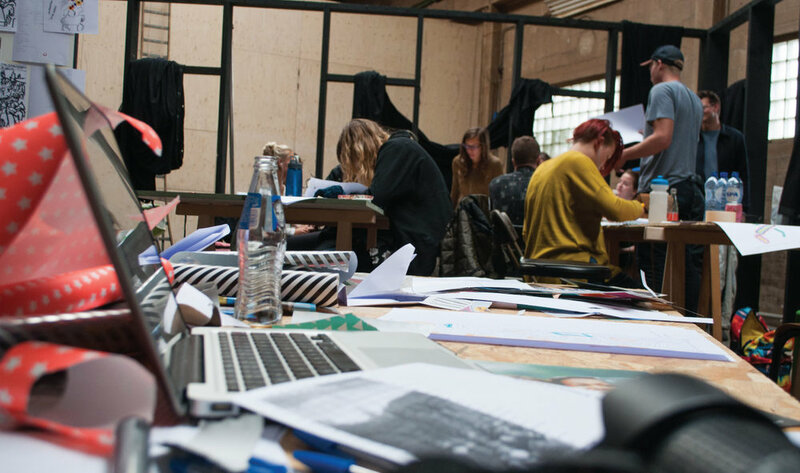 This workshop is the last of the three workshops during the University of Wisconsin-Stout Summer 2015 Dutch Contemporary Design Trip. The Just Judges is a project based on a panel that was stolen from an altarpiece in Ghent, Belgium. Upon arriving in Ghent, the first stop was the famous church. We got to observe the missing piece and then visit the museum that is trying to re-design it. Graphic Designers from Holland and Belgium, Joris Kritis and Bart de Boets, led the workshop in an studio space that was recently considered abandoned and is now an artist space. There are many conspiracies about who stole it and what the current whereabouts are. Over the period of two days, 13 designers from UW-Stout worked together and separately to re-create a version of this piece The Adoration of the Mystic Lamb / The Just Judges. The "judges" Joris Kritis and Bart de Boets made their decisions on what would fit in the book and what did not match. It was a workshop turned publication.